He spent his childhood in a small town Stanichno-Luganskogo since he was four. 1988-1992 – years of study in the Lugansk State School of Fine Art where he learned Drawing, Painting, Composition (his teacher was Kodenko A.I). From 1992 till 1994 Vladimir served in the Ukrainian Army in the region of Nikolaev and Odessa. 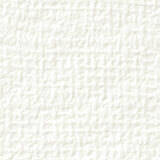 Since 2003 he becomes the active participant of all Producer Centre Boyko Projects. 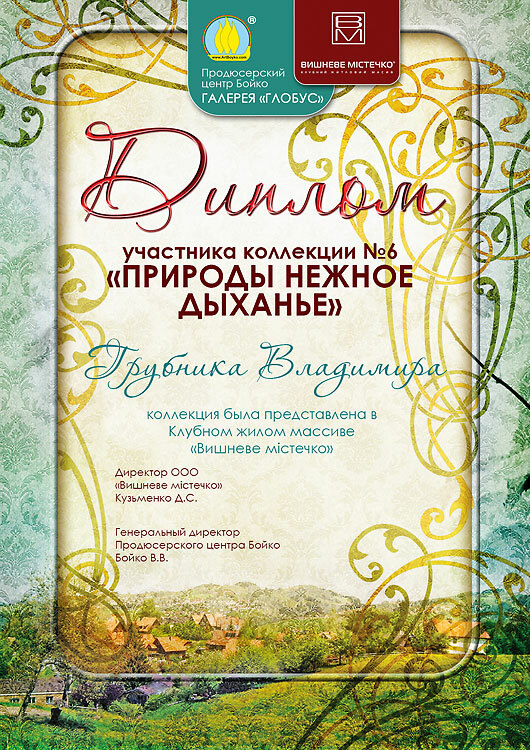 Many of his artworks can be found in private collections in Ukraine and in other countries. Recently he lives and works in Kiev. 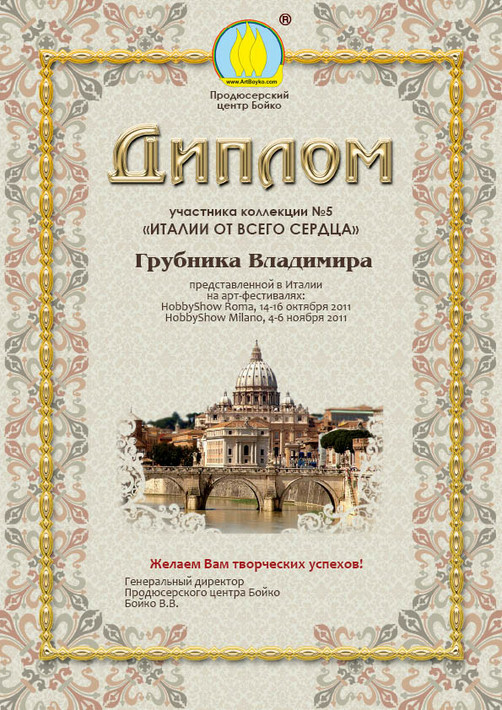 He has been awarded by the diploma for the participation in the Exhibition Blessing (Project № 40, Berlin). 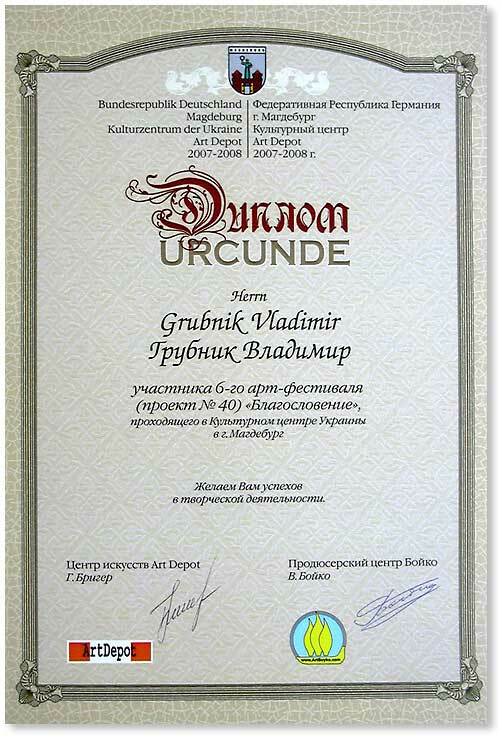 He has been awarded by the diploma for the participation in the 6th Art Festival Blessing (Project № 40, Magdeburg). Participant of exhibition-collection № 2 "Dew"
Participant of exhibition-collection № 5 "To Italy with Whole Heart"
Awarded by the diploma for the participation in the Exhibition "Blessing" (Project № 40, Berlin). 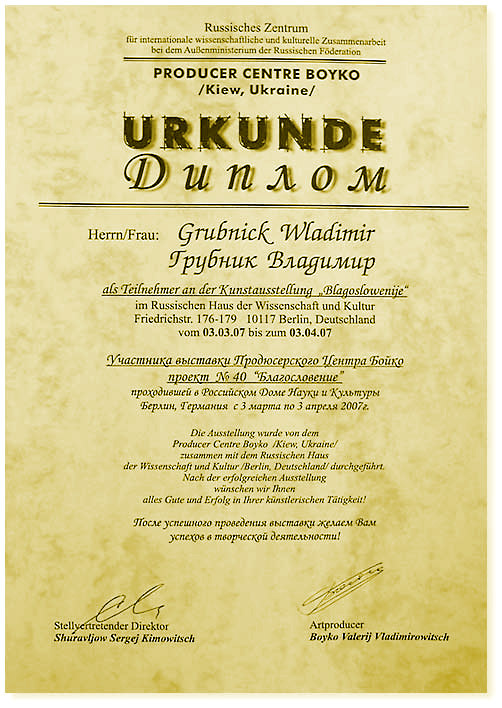 Awarded by the diploma for the participation in the 6th Art Festival "Blessing" (Project № 40, Magdeburg). 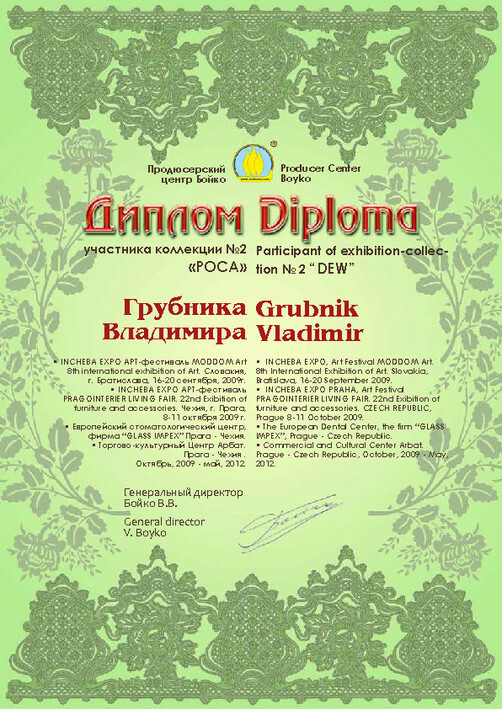 Awarded by the diploma for the participation in The collection № 2 "Dew" (Slovakia, Bratislava; Czeska Republika, Praga). Awarded by the diploma for the participation in The collection № 5 "To Italy with Whole Heart" (Art Festival HOBBY SHOW ROMA - Italy, Roma, 14-16 October, 2011; Italy, Milano, 4-6 November, 2011). Participant of exhibition-collection № 6 "Nature's gentle breath." (Residential Club District "Cherry Town"). 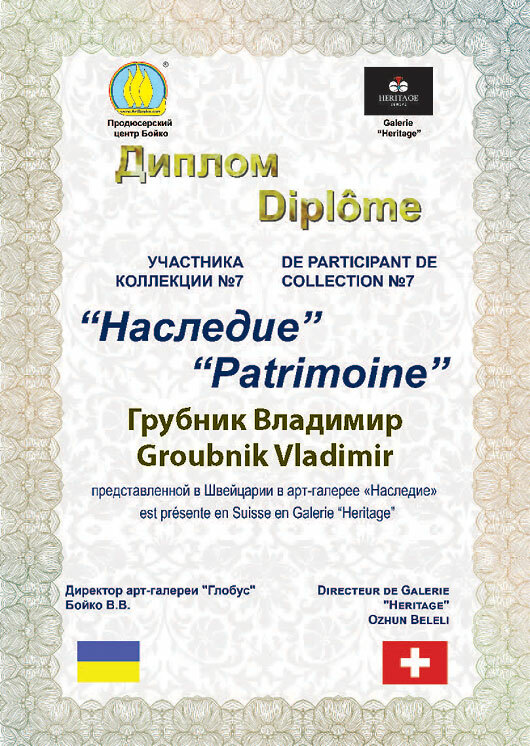 Awarded by the diploma for the participation in The collection № 6 "Nature's gentle breath." (Residential Club District "Cherry Town").